Nothing like "little caterpillars" and great "little caterpillars". That was neat that they could bring them home and they hatched. I have been seeing some yellow swallowtails in our yard on the weed flowers. It takes me a while to mow as I only mow what I feed to the steers. I guess the butterflies like that. An honor and a great learning experience. Cort does look like he is having a heart to heart with that butterfly. Ooooh, that is FUN! 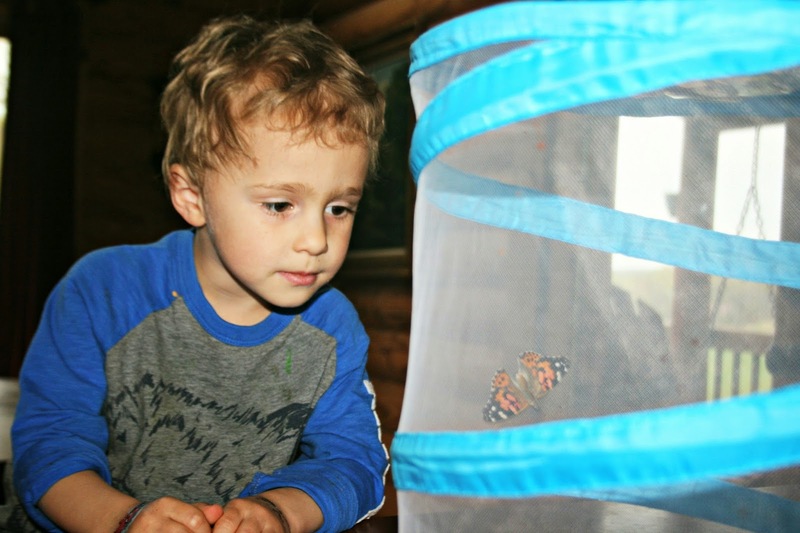 We used to raise monarch butterflies every summer. If you want a simple, easy and fun thing to do, plant some milkweed on your property and watch for them to come. Once they lay the eggs, you can bring the leaves into the house and raise some monarch caterpillars. It's a really cool thing for the kids to watch and it is little to no work. You have to have the host plant, which is milkweed. And have a few plants so that you have enough leaves for the instars (caterpillars). 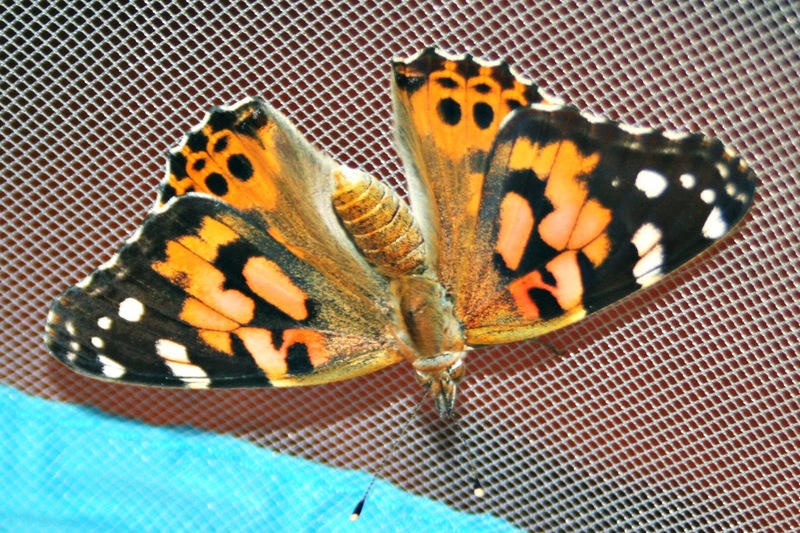 We had some fun visiting butterfly hatcheries in Central America. Nature is magic. What a fun experience! Love the last photo. how neat to be able to set them free at your place! 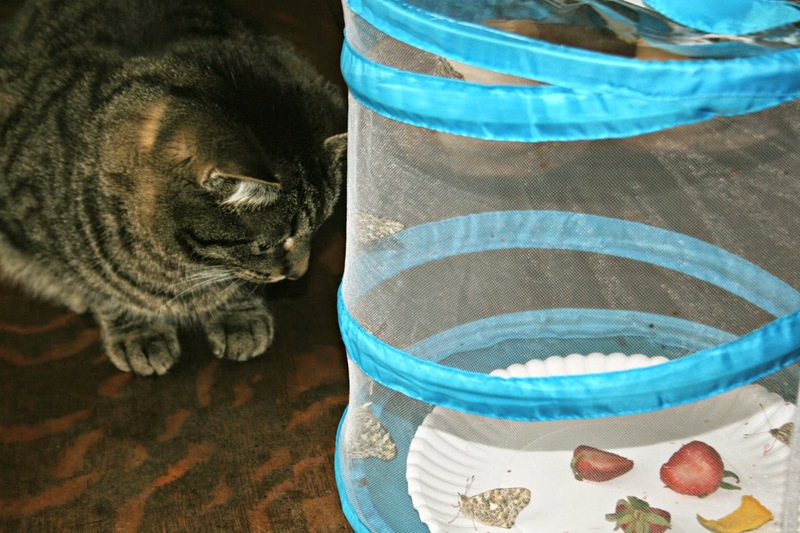 My boys really loved collecting watching the stages of a butterfly last year. Even I thought it was fascinating. That's a cool project for your boys, for sure. My daughter did that once too and we all loved it! Such a huge honor, indeed. What a cool thing for your boys to observe. Cort talking to them is really cute! dat is wel heel leerzaam voor de kinderen. These three pictures are so good! I'm especially fond of your kitty looking at the butterflies. What an awesome spring break this was! What an awesome thing for the boys to get to do! How cool! Great for the boys... and apparently for the kitty too. what a fun project! how cute "do you remember when you were a caterpillar"!! funny about the kitty! These are the activities my students used to remember! Is it a Painted Lady? I had one early, as they overwinter here. Happily! Your boys are really gorgeous. how life has been created. wonderful comments in my blog posts! I love your cat too. What an awesome experience for the boys! Its always fun to learn from observation. How cute. The kids must have enjoyed having the butterflies home. How fun for your gang to see the changes. Our young cats would be right there watching as well. They have a indoor window perch next to bird feeder--we like to call it kitty tv as they love to watch what is going on in the world. What sweet boys you have :) and what a fun project. That cat! Entertained the whole time I imagine. That was nice of you to bring them home. How awesome for the boys. Love the cat looking at them....would love to know his thoughts. Oh we loved this post!